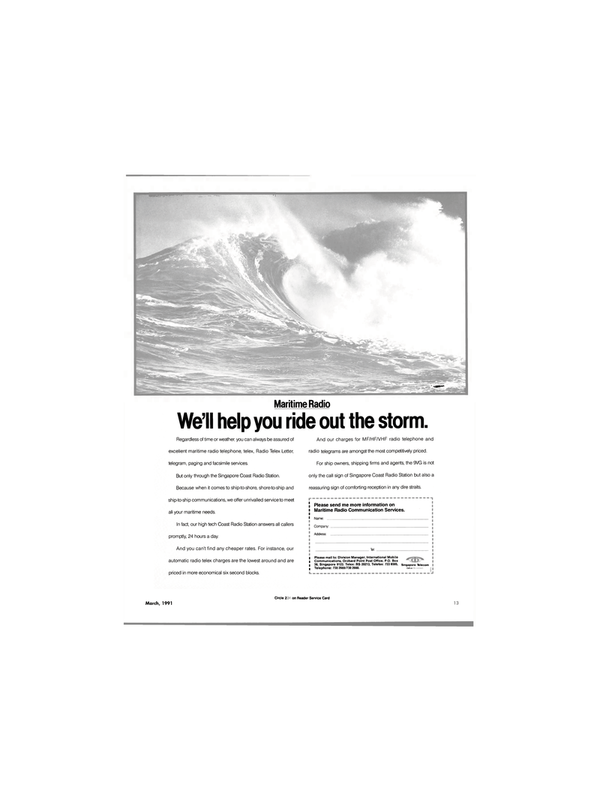 We'll help you ride out the storm. Regardless of time or weather, you can always be assured of excellent maritime radio telephone, telex, Radio Telex Letter, telegram, paging and facsimile services. But only through the Singapore Coast Radio Station. Because when it comes to ship-to-shore, shore-to-ship and ship-to-ship communications, we offer unrivalled service to meet all your maritime needs. In fact, our high tech Coast Radio Station answers all callers promptly, 24 hours a day. And you can't find any cheaper rates. For instance, our automatic radio telex charges are the lowest around and are priced in more economical six second blocks. And our charges for MF/HF/VHF radio telephone and radio telegrams are amongst the most competitively priced. For ship owners, shipping firms and agents, the 9VG is not only the call sign of Singapore Coast Radio Station but also a reassuring sign of comforting reception in any dire straits.